Download an app for every occasion to your mobile device: if you’re new to the city, if you’re looking for a place to eat, if you’re a fan of architecture or history, this is the best way to get to know Barcelona at your own pace. 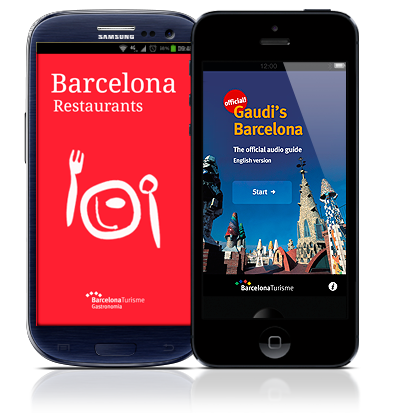 The Official Guide to Barcelona on your smartphone, another city idea to provide interactive tourist information, easily and rapidly. The application is available for iPhones and Android and the content is in Spanish, English, French, Italian and German. If you want to discover Barcelona’s medieval history, this is a must-have app! The descriptions are accompanied by music and sound effects, some 150 photos of the places on the route, practical information about visiting the buildings, opening times and their Google Maps geolocation. The 22@Barcelona audioguide can also be used without an internet connection. Official audioguide. With Barcelona MetroWalks we invite you to discover a series of closely connected neighbourhoods beyond the city centre. By combining the metro and other public transport (bus or tram), and walking routes, you’ll be able to discover Barcelona from an insider’s point of view: its neighbourhoods, its history, its urban development… like a local and at your own pace. This app contains a map of Barcelona featuring each route to help you get your bearings and find the areas you want to visit. You’ll also find the location of the points of interest and the route you have to follow to get to them. When you are approaching each point, a descriptive audio track will play automatically. There are also photos to enable you to identify the places on the route as well as information about opening times, if there is an admission charge, and the services theyoffer. We are currently preparing new audioguides about Barcelona.